October 7, 2005 — In response to overwhelming demand, the "Jung Won" Buffet at Grand Hyatt Seoul reopened on Sept. 23, 2005 with a completely new look and buffet selections. The "Jung Won" buffet, after undergoing two months of comprehensive renovations, has been transformed into one of the city's most elegant buffet restaurants, complete with an abundance of warm mahogany woods and custom designed brown carpets. The high white ceilings, accentuate the drama of the dining experience and the luxury of the space, complimented by the panoramic views of the city through the restaurant's floor to ceiling walls of glass. It is a sight unmatched anywhere else. A broad array of mouthwatering international dishes is offered from all parts of the globe, from Western, to Southeast-Asian to Korean. 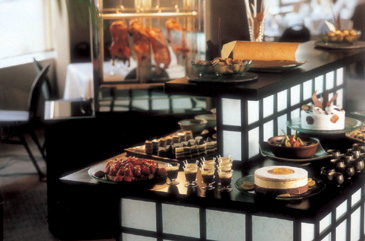 The buffet's classic Chinese dishes, such as Peking Duck and fresh Sushi, are presented through live preparation stations staffed by the restaurant's talented specialty chefs. The buffet also features special "Kid's Corner" offering items tailored to a child's tastes, including everything from mini- hamburgers to pasta. The "Jung Won" buffet is open Friday through Sunday, 6 p.m. to 9:30 p.m., with dinner priced at 52,000 won (some US dollars) for adults and 30,000 won (some US dollars) for children. Lunch is also offered on Sundays and holidays from 11:30 a.m. to 2:30 p.m., at 47,000 won (some US dollars) for adults and 27,000 won (some US dollars) for children. For information and reservations call 799-8169.